I’m at the process now in my Flixel game, Chip (demo, trailer), where most of the content I want for this release is there. 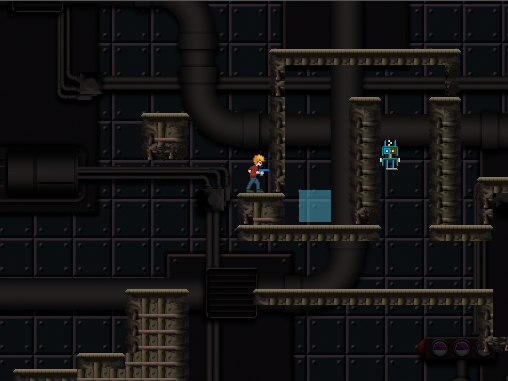 So lately, I’ve been focusing on level design and plan to delve into fine tuning all of my levels shortly. First though, I thought I’d reflect on a few things I found interesting while really experimenting with level design for my frist time. As a quick preamble – I have close to zero idea what I’m talking about. While I write this in the style of advice, it’s purely meant to be reflective and based off my own individual experience. My very first levels revolved around making interesting patterns or an elegant overall structure. This was a disaster and I ended up reverting to a functional perspective as much as I could. 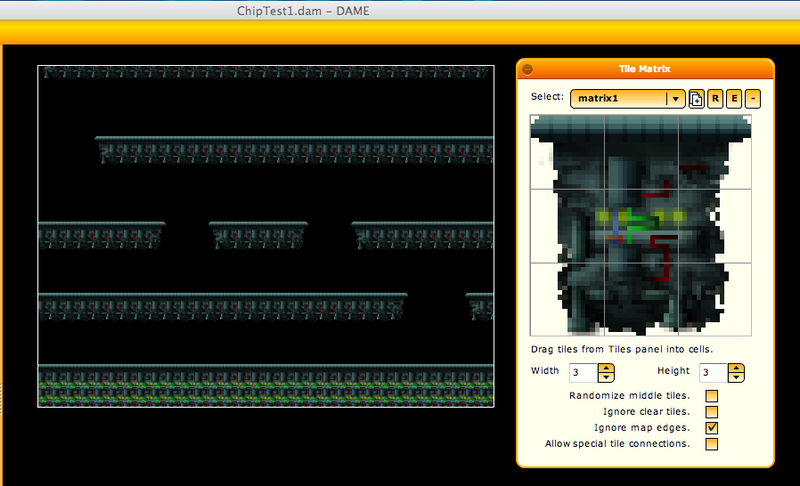 I even switched out the tilesheet I was using in my Tilemap editor (DAME) so I wouldn’t be swayed by how it looked. A brief note on DAME. If you’re editing levels using a simple tilesheet I highly recommend it. It’s free and while at first I couldn’t stand it, I’ve grown to love it. It’s like editing film on a Steinbeck: the fact that it’s not quite so flexible makes you think harder about what you want to do. you’ll see they look pretty similar, but this only highlights further the actual dynamic differences between them. These levels are “solved” in almost completely different ways and are actually pretty distinct. As another quick note, the level on the right I’m particularly fond of, because while it’s easily the toughest level in my game, I’ve found at least 6 different ways to beat it, which has been a goal of mine from the start. Often in my game I came up with new mechanics or new ideas on how players and A.I. should interact. 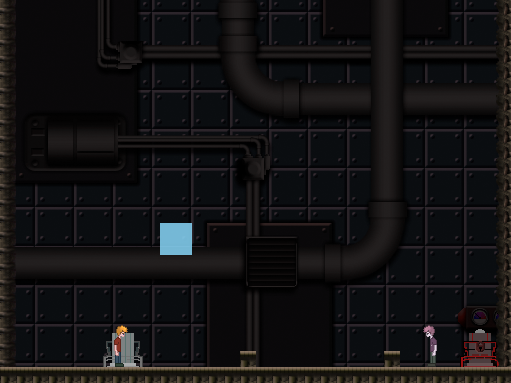 However, coming up with level ideas for this just sitting and thinking didn’t get me far. The trick for me was to throw literally a random, basic level together in DAME in about 30 seconds, bring it into my game, load up my player and any A.I. bots and just start messing around. Eventually I’d find this little aha moment, this little “oh, this is kind of neat, wouldn’t it be cool if the player could do this,” thought, and that’s when I’d go back to the drawing board and completely remake the level to serve that thought. It’s sort of like Marc Leblanc says: “Fail Fast.” Getting a crappier level in your game to test the mechanics ASAP is way more worthwhile than thinking out a high concept level on paper first, only to find it’s never going to work in practice. I sort of felt like I wasn’t being creative when I’d plunge into a basic level, discover some emergent behavioral oddity that was interesting, and then make a level just off that “lucky” discovery. Really though, if this can happen at all, hopefully it’s a testament to your mechanics being at least somewhat interesting. Furthermore it will really test your fine-tuning down the line. For me though, it probably was just luck. What this should mean is maximizing the minimum amount of awesome your level can be, but that’s actually not what I’m talking about at all. I was just trying to come up with some clever way to write that minimalist levels are awesome, but completely failed at that. Anyways, minimalist levels are awesome. A light touch can really highlight something cool about your game and make for more interesting situations than you think. I'm only now realizing these screenshots mean almost nothing if you're not familiar with the mechanics of the game. Oh, well. That’s all for now. I’ll update this post in a few years once I learn the first thing about actual level design.